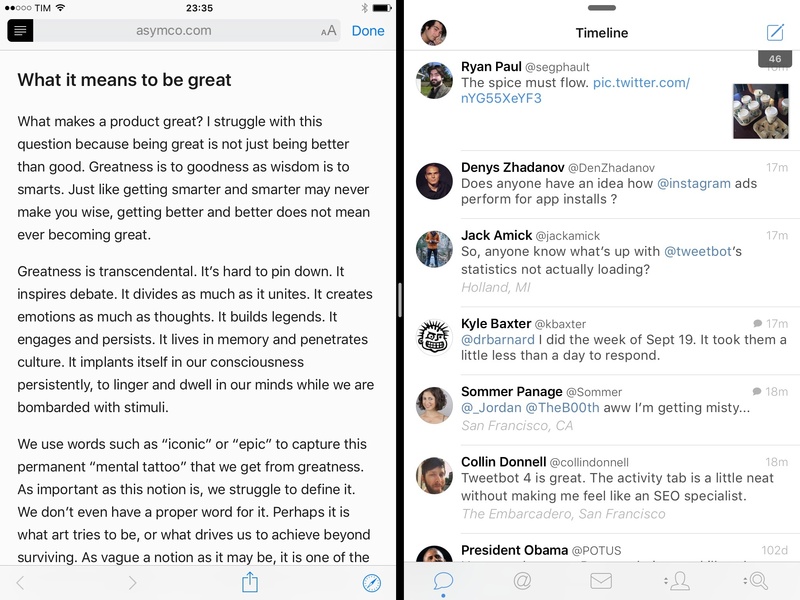 Left: Safari Reader, automatically activated by a Newsify web view. In my review of iOS 9, I included a link in a Safari footnote mentioning the possibility for developers to activate Safari Reader programmatically in their apps. Apple has some documentation on this: if available, apps can choose to switch Safari View Controller to Reader mode automatically, without requiring users to tap the Reader button first. I wrote that I hadn't seen any example of the feature, but I was curious. Newsify, a powerful (and highly customizable) RSS reader for Feedly, has recently been updated with a watchOS 2 app and support for iOS 9 multitasking. Among the various new options, Newsify lets you pick Safari View Controller (called "in-app Safari" in its Settings) for viewing articles, with an additional Reader view that can also be toggled in Settings. This way, every time you tap on an article's web view in Newsify, it'll open Safari View Controller in Reader mode by default, stripping away unnecessary content. Here's what you can do to try this out. Open Newsify, go to Settings > Article Browser > Globe Button Action and choose 'Open in Safari'. In the same screen, under Safari Open Action select 'Open Safari In-App (Reader view)'. Now, go back to the list of articles, tap one, and tap the globe icon to open the article's web view. Safari View Controller will open the webpage, briefly load the main content, and then Reader will activate automatically, with the same appearance settings you used the last time you opened it elsewhere on iOS. I think this is a great way to provide a "readability" mode in apps by combining the benefits of Safari View Controller with the convenience of Safari Reader. I hope that more apps will consider this option.